On the Ariwa website, she is presented as the Queen of the Roots Daughters and not without reason. 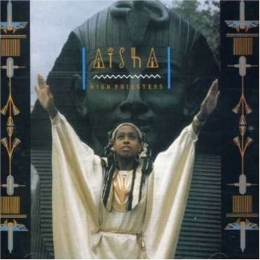 Born in 1967 and already singing eight years later, Aisha would team up with Mad Professor in the 1980's to start what would grow out to a Movement of female Roots singers. High Priestess is in many ways to be considered as a document. The album was originally produced in 1986, musically way ahead of it's time. In the same time, it was not so common in that time for a female singer to emphasize on Roots and Roots topics rather than Lover's Rock and/or Dancehall. The lyrics go deep, very deep. "If there is someone to be blamed, let the politicians be named", for example. In a well worked out combination of lead and backing vocals, it becomes clear that Aisha really is one of the best female singers Reggae has ever known. As said, the music was way ahead of it's time. In the historical context, it is really interesting to hear Aisha announcing the coming digital age in music and how it will be used to spread conscious vibes. Not a popular opinion back in that time! However, the best albums and other creative productions are made in spite of popular opinion, in spite of the spirit of the time, in spite of the wishes of the mainstream recording industry of which the Mad Professor has managed to stay away from throughout the decades of his carrier.